Quilts From My Past – Which Way Is Up? Today I’m linking this edition of Quilts From My Past to Krista’s Throwback Thursday post. 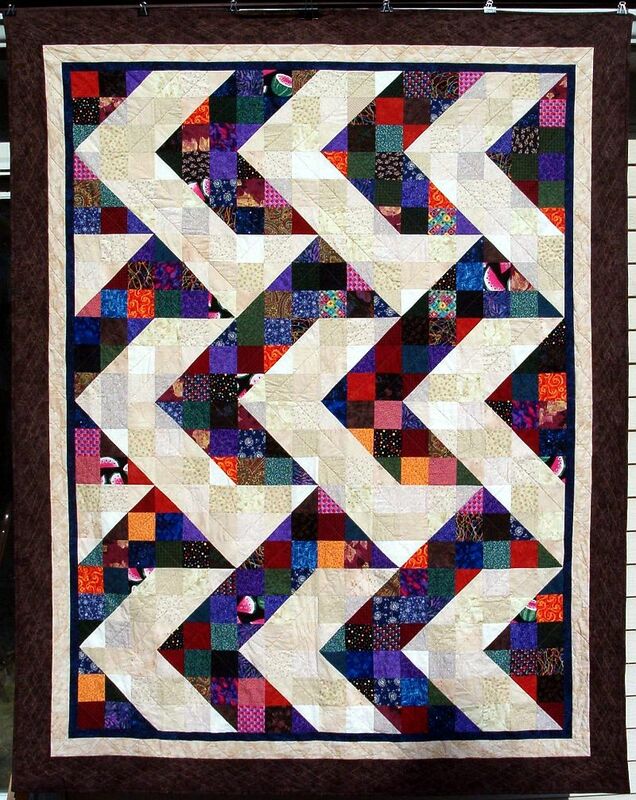 This quilt was started in the November 2004 on-line virtual retreat hosted by Wonder Cut Ruler. I’m not sure when I purchased the Wonder Cut Ruler, but I know this is the first quilt I made with it. As part of the ‘retreat’ we simply made the 9-patch blocks. The final layout was up to the individual quilter. My husband and I jointly worked on the layout. He’d tell me which block to turn and I was crawling on the floor flipping the blocks around. Once I we had the layout worked out I got the center sewn together. It was probably 18 months before I got the borders on the quilt and got it quilted and bound. The outer border and backing is a cool looking fabric. 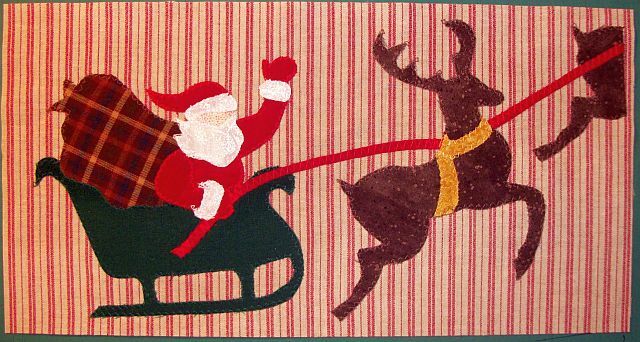 I originally bought some to make a reindeer on my Christmas Block of the Month. Once I decided the fabric was perfect of my quilt, I raided a friend’s stash as she bought the rest of the bolt! The quilting is simple. Straight lines through the “arrows”. flying geese in the light border and a diamond cable in the outer border which I found in a Georgia Bonesteel book. The quilt measures 69″ x 86″. Warm and Natural batting. This quilt is well used. It’s on my half of the bed. Wonderful contrast between darks and lights, but also so many little punches of color. Wish I had such a nice collection of low values. No wonder you have continued to enjoy it. What a unique layout.. I love the variation from a traditional chevron pattern. Thanks for linking up at Throwback Thursday today. Ha ha! I thought I was the only one who put a quilt on her side of the bed. The big quilt comes off in the summer, but my feet still get cold — a side effect of my blood pressure medicine. I really like the layout you/he settled on. You were ahead of the times, leading the way into the modern movement! Nice layout.